Sorry, it's too late to start writing the next review, but that doesn't mean I can't try to keep everyone in suspense. Ok, that's probably not the best picture, but I'm guessing some of you -think- you know what it is ...well, you are partially right, but this particular version has a very unique attribute. Stay Tuned! Ben and Jerry's Milk and Cookies? 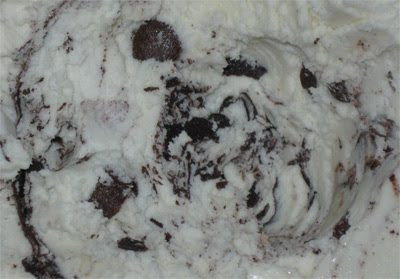 BUNNY TRACKS ICE CREAM by Blue Bunny! !